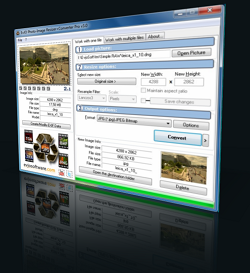 Resize digital pictures and apply special effects easily and automatically. 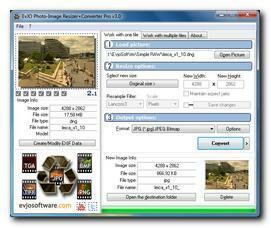 EvJO Photo-Image Resizer+Converter Pro makes resizing multiple images as easy as downsampling a single one. Just select one or more pictures, drag and drop them onto EvJO Photo-Image Resizer+Converter Pro, select your desired size and special effects to apply, and hit Convert to do the job. You can add watermarks, modify images' brightness, contrast and saturation, and add frames and signatures. Read/Write/Modify EXIF data (Exchangeable image file format (Exif) is a specification for the image file format used by digital cameras. Resizing images is as easy as 1-2-3 – literally! EvJO Photo-Image Resizer+Converter Pro features a simple three-step routine to resize one or more images. Just drag & drop your pictures onto the EvJO Photo-Image Resizer+Converter Pro main window, select the desired size of the images as well as any special effects, and hit Convert to perform the job. Changing size or aspect ratio of many images is just as easy as resizing a single one. You can process multiple images by following exactly the same 1-2-3 routine – can there be anything easier? Resize your images, specify different aspect ratios and apply a variety of special effects to a batch of digital pictures in just a few clicks! EvJO Photo-Image Resizer+Converter Pro can work completely unobtrusively, doing the batch job silently in the background and without asking for your supervision. EvJO Photo-Image Resizer+Converter Pro makes it easy to give your pictures a 'pop' by adjusting their brightness, contrast, gamma, hue and saturation in just a few mouse clicks. EvJO Photo-Image Resizer+Converter Pro recognizes and supports EXIF information, allowing you to preserve or modify the information as you wish. Want to give your images an ancient look? The recently added grayscale control produces pictures with a classy black-and-white look. Ever wondered how professional photographers manage the variety of aspect ratios found in common prints? 4x6, 5x7, 8x10, 8x12 and bigger enlargements come in a bunch of different aspect ratios that almost always differ from those of your pictures. Make your pictures look right on paper and print images with an appropriate aspect ratio by specifying it with EvJO Photo-Image Resizer+Converter Pro! EvJO Photo-Image Resizer+Converter Pro supports JPEG, GIF, BMP, PNG, PCX, PSD, and TIFF images, allowing you to convert pictures between various file formats just as easily as everything else. Simply specify the desired output format and set any compression settings to convert from any one image format into any other. Copyright © 2017 EVJO Software. All rights reserved.